In October of 1968 The United States Congress signed the National Wild and Scenic Rivers Act. 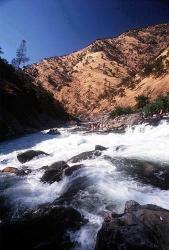 On September 28, 1984 the Tuolumne River was added to the National Wild and Scenic Rivers System. The Wild and Scenic Rivers Act protects river corridors that possess exceptional scenic, recreational, fishery and wildlife values. The preservation of these rivers allows the public to enjoy the benefits of these true Wild and Scenic Rivers. Since the injunction of the Tuolumne river to the Wild and Scenic Rivers System, the Clavey river, a tributary of the Tuolumne has also been up for consideration to be added to the system. The Clavey was being considered for designation to protect it from threats of hydroelectric development. The Clavey is not designated Wild and Scenic, but has been spared from hydroelectric projects. The Clavey was saved with the help ofFriends of the River (FOR); a river conservation organization.